Early mariner Richard Henry Dana first visited the Dana Point real estate area eventually named for him in 1851. Dana’s sea journal about hide trading, “Two Years Before the Mast” is required reading at the local high school. A bronze statue of the famous sailor and author can be viewed on the island across the bridge at Island Way and Dana Drive. The jetty across from Dana’s likeness separates the marina from the Pacific Ocean and is the site of famous wave Killer Dana. 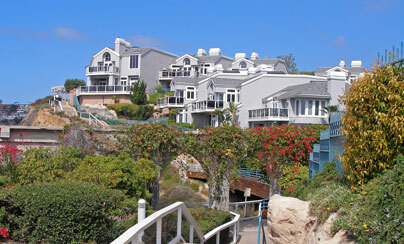 Dana Point’s hot spots include a walk around the harbor to the jetty and Ocean Institute. It’s a short jaunt from there to Lantern Bay Park, and a drive up PCH to Salt Creek Beach Park, where luxurious Ritz Pointe real estate is carved into a cliff. Mid point from the harbor to Salt Creek there is a lookout and hide trail. Be sure to stop by Dana Point’s 24-hour Harbor House Cafe for eats, across from trendy wine bar Purple Feet, which is adjacent to Killer Dana, a surf shop named after aforementioned famous wave, altered after construction of the harbor. Located at the foot of Golden Lantern on Dana Point Harbor Drive below Dana Point’s residential real estate, a thriving marina is home to 2,500 boats. The wharf area includes several gift shops and eateries. From the southern end of the marina visitors can board one of many fishing vessels supplied with bait, tackle, rods and reels. Boat excursions are available for up to two days. Whale watching boats take off in winter months, and jet skis, parasailing and other sea sports are available. Sea transports to Catalina take off daily. There is also a facility to learn kayaking and sailing. The Ocean Institute at the north end houses various educational programs about the sea and local lore for children and adults of all ages. Visit a tidepool, touch a starfish, or board the replica tall ship Pilgrim for a living history lesson about Dana Point. Doheny State Beach is located at 25300 Dana Point Drive. From PCH, head north at Del Obispo. Doheny is one beach immortalized by the Beach Boys’s “Surfing USA.” From Doheny, visitors can fish, swim, surf, bicycle, camp and stroll. The campground offers showers, barbecue pits and beach rentals. The recreational park was named for Edward Doheny (1856-1935), the first person to discover oil in Southern California. Capo Beach’s volleyball nets fill the sand while pit barbecues stoke the air. Capistrano Beach is south of Doheny, voted Best Campground in Orange County. Lantern Bay Park is located on a steep-graded open grassy space above the first condominiums in the area, built in the 1960s. Lantern Bay Village faces the Harbor above Doheny Park and Capistrano Beach, where some of Dana Point’s finest real estate can be found. Nestled in the hills east of the harbor is historic Hide Trail and the Lookout and gazebo where locals and homeowners of Dana Point real estate take out-of-towners for exceptional vistas of the lay of the land. Breathtaking views from the gazebo is at the terminus of Blue Lantern off PCH. Catch a bird’s eye glimpse from these popular headlands of the harbor and replica tall ship Pilgrim, moored in front of the Orange County Ocean Institute. Between Amber and Violet Lantern streets, Hide Trail, a quarter mile long walking trail set into the edge of Dana Point’s bluffs, offers visitors a bit of history with a bronze replica from the days of hide droughers. Pricey Dana Point real estate skirts the walkway that houses the ruins of a hotel from the Great Depression. Midpoint on Hide Trail is a triple archway that began as someone’s dream resort center but that ended when the stock market crashed in 1929. Besides the elaborate archways, there are the beginnings of a pebble stone pathway beneath the wooden bridge-like portion of the path. From this vantage point, visitors can snap panoramic photos of the shrubby landscape against the blue Pacific. Located off PCH at the foot of Niguel Road, Salt Creek offers visitors a variety of recreational options. While surfers mix it up with dolphins amid wave swells, picnickers and kite flyers make use of the grassy grounds from dawn until 10:00 pm. Beautiful Dana Point mansions dot the hillside shared by world class Monarch Beach Golf Links. Before and after storms, locals line up above the park watching big waves hit the shore below.